Though some of us might not have to deal with this, there are many people who have to take care of dreads in varying temperature and climates. If you live in an area where the weather changes dramatically from season to season then these tips are specifically for you. If you didn’t know, your hair reacts differently to different types of weather and climate changes. Just like your skin, hair is very porous and can become dry and oily just like our skin can. Here are a few things to remember when seasons are changing to warmer temps. Check out our winter guide here for ideas when it’s cold. In the winter, we are all fighting for moisture in the dry, cold months. In contrast, the summer provides more moisture- sometimes unwanted. Humidity, rain, and changes in air pressure can all have an effect on your hair. There are products called humectants that we need to avoid during the winter because they cause too much moisture in all the wrong places, but in the summer these work wonders. They have a scientific method that will help your hair retain water without overdoing it. These products are made of things like honey, aloe vera juice or gel, or something like vegetable glycerin. The key to these products is that they take moisture from around you and draw it inward keeping your dreads healthy and shiny all summer long. This being said, there are other alternatives to products like this because there is a heated debate on whether these should be used in a dread maintenance regime. This is one main factor for those with new or freshly done dreads. Your scalp will be sore initially after having dreads done, but not only that, parts of your scalp are more exposed that before and will burn very easily. Sunscreen is your best friend no matter who you are, but be cautious about slathering sunscreen on your scalp because your dreads are new and ready to take in anything that they can and sunscreen in your dreadlocks can cause some stinky and sloppy problems. Instead, try varying your hairstyles like a thick braid, maybe a pulled back ponytail or a bun on the top of your head. Switch these up so that the same parts of your scalp are not exposed to the sun all day, every day. Hats, silk scarves, and headbands that have UV protection are also a great investment too. We have talked about washing a lot and there’s good reason for that. Washing too much or too little is one of the many mistakes we can make with our dreads. By taking our advice, and the advice of many others with great results, a clarifying shampoo will be a summertime essential. This will keep the oils in check and will help keep things clean after a sweaty summer day. It leaves our dreads looking great and healthy and help them form tighter in the process. All in all, a clarifying shampoo is one of the most important parts of any maintenance routine but especially in the summer. We are outside, sweating, dirty, and doing so many more activities in the nicer weather that there is no telling what might land in your hair. Take care to keep it clean without losing the progress of keeping tight and healthy dreads. Summer is such a fun season but it’s no time to let yourself go. 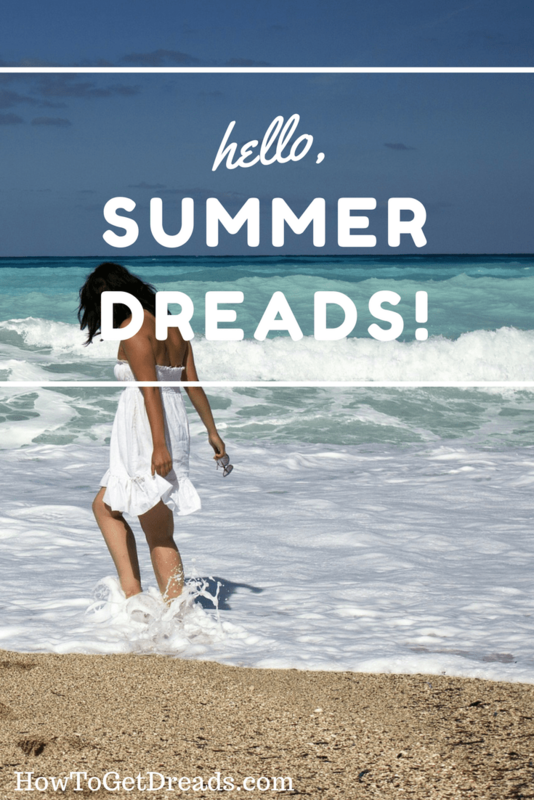 You have to work all year round to keep your dreads formed tightly, smooth, and good looking and it’s all worth it for the stylish and rocking look that you can have all summer long.